Not sure what to get your friends or family members for the holidays, or a birthday? Is someone planning an Anniversary trip or Honeymoon trip to Savannah? Give them something memorable, with tons of great photo ops!! The gift of a great life experience ALWAYS fits! Select this private carriage tour for two, and your work is done! This gift certificate is for a one hour tour of the historic district. We can either snail mail you a cute certificate, or email one to you. 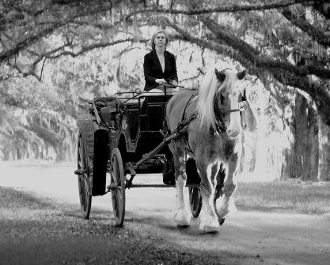 Then, the receipient can call us to make arrangements to take their carriage ride at a time that is convenient for them!